Hello to all traders! I want to tell you about how you can use the popular indicator for Metatrader4 Pokilopers. In principle, the interface of the indicator is very simple and difficulties arise rarely, but still not everyone knows about the rules of trading with this indicator and how to make profit with it. 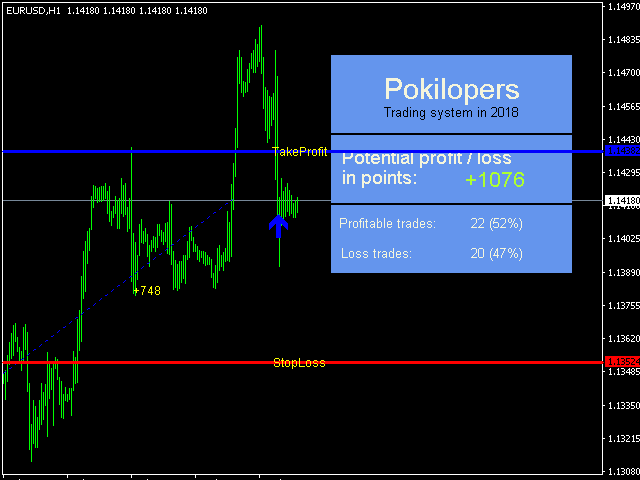 Suppose you have already downloaded Pokilopers and installed it on your Metatrader4. Further, I recommend to open the EURUSD H1 timeframe. I trade it on this currency pair. After the indicator has been added to the chart, we are waiting for its signal. The indicator signal to open a trade is a blue arrow. The peculiarity of the indicator is that the arrow appears when a new bar is opened. This makes work easier for us, because we can check the market only once per hour, as we trade on the hourly chart. That is, we do not need to constantly sit at the computer in anticipation of the signal. Personally, I check the signals through my tablet and if the signal appears, then I sit down at the computer and see if any important news came out. During the important news, I do not trade. If there is no news, I open a purchase order. Then the most active phase of trading begins, I follow the price so that it does not rise above the Take Profit line, which the indicator drew and did not fall below the Stop Loss line that the indicator drew. If the price has reached any of the lines, I close the order. One such transaction can bring me $ 500-1200. So for me this is a very important moment! And when I opened the deal, then I concentrate completely on the chart and wait until the price reaches the line and I get my money! I do not understand traders who say that they want to trade, but they do not have free time))))))) If you do not have free time to earn money, do not start trading in forex. If you want to earn big money here, you will have to spend a lot of time on this business!